See source of photo and related article here. In Canada, the United States, and the United Kingdom, among other countries, there are active programs for recruiting new anglers to recreational fishing. The reasons for these programs vary among countries, but the usual concern is to counter decreasing interest and participation, which threaten political and financial support for recreational fishing. Norway now gives this a unique twist. The Norwegian government, in response to a dramatic decrease in the number of boats participating in whale hunts, has called on the nation’s whaling industry to reverse this trend and recruit new participants. The number of Norwegian vessels actively hunting whales decreased in the last decade by over 40%, from 33 in 2001 to 19 in 2011. Because of decreasing fleet size, the government has gradually increased annual whaling quotas. In 2011, it authorized hunters to cull 1,286 Minke whales, up from 549 whales the hunters were allowed to take a decade earlier. 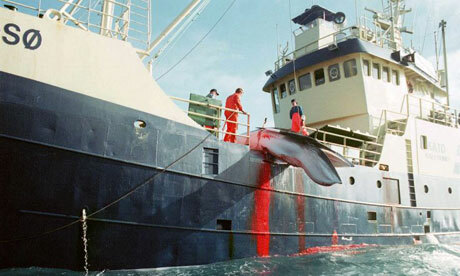 Despite the increased quota, in 2011 whalers were able to take just 41% of the permitted number. See the article here. Beel asks, why would hunters leave the whaling fleet? Why would they leave if they could make money at it? Oh, wait. Maybe that is the problem? Whale meat is eaten in Norway. But it is not a large component of the diet, particularly among the younger generations. There is a market for whale meat, but it is not too large. Whale meat can be gotten for a fair price, which suggests it is not a scarce commodity. 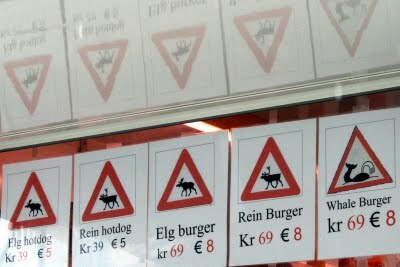 A tasty whale burger goes for only 69kr, currently about $11.50 in US currency. This is not particularly expensive for anything in Norway. Why, then, would the Norwegian government want the whaling industry to meet its allocation? To reduce the cost of whale meat and burgers? Let Beel present an analysis: this is intended to allow Norway to maintain its option to harvest at past amounts, rather than facing international pressure to reduce harvest, perhaps permanently, to that needed only to support the current market. 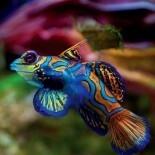 This entry was posted on January 20, 2012 by denstormer in Fishing and angling and tagged Europe, Whaling.